KAT100 antenna tuner below the K2/100. My KAT100 has been a little troublesome for a couple of years now. Sometimes, when turning the K2 on, the KAT100 would take a second or more to turn on, and the K2 would act like the KAT100 wasn't present, giving NOT INST when any of the KAT100-related buttons were pressed. I noticed it sometimes at the Walton County QTH. When it did happen, cycling the power a few times usually got rid of it. Sometimes I had to leave the rig on for a while. Later, when I moved the radio back to Gwinnett, it didn't happen any more. Then I moved the radio to the new Fulton County QTH. This problem appeared with more frequency. Indeed, it happened nearly always, and warming up the rig for an hour or so the only way to get around it. This sometime problem had become annoying, and I wanted to get to the bottom of it. At first, I thought it was some kind of power delivery problem in the KAT100. Normally, the KAT100 is supplied continuous12v power on the coaxial jack J1. The K2 supplies a signal 12CTRL on the J3 Control jack that goes to 12v when the K2 is powered on. This signal turns on Q1, and Q2, which supplies 12v power to U8, the regulator chip, which supplies 5v power to the unit and everything comes on. That theory was shot down quickly. As soon as the K2 was switched on, the 12CTRL voltage would come up immediately, and U8 would deliver 5 volts immediately. That part of the circuit was working perfectly. Power was available to the KAT100 the moment the K2 powered up. Even so, the KAT100 LEDs would not light up right away. Sometimes, it would be a second or two, sometimes ten or more seconds. When this happened, I'd get the NOT INST behavior. If the KAT100 LEDs lit as soon as I powered on the K2, everything was fine. 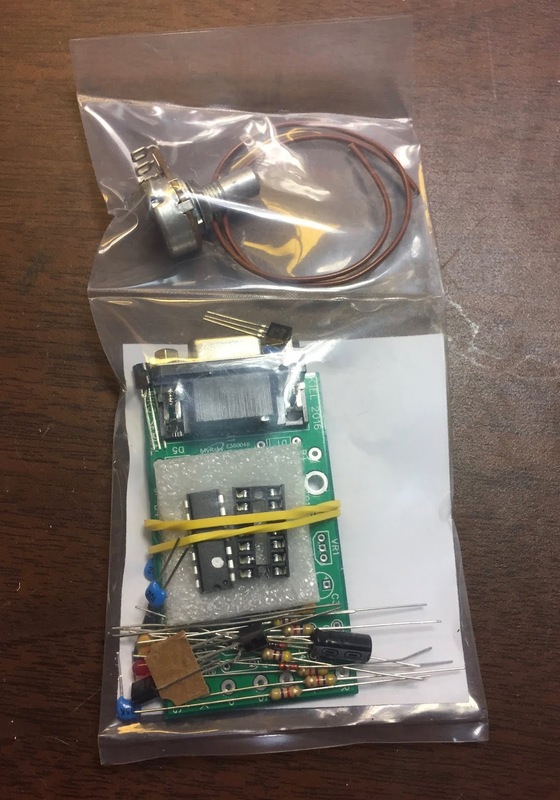 My next theory was that must have been something wrong with the AUXBUS connection -- the internal bus that the K2 uses to talk to the micro controller in the KAT100 (as well as the several micro controllers in the K2!). That one was busted as well, as a scope probe revealed very healthy transitions on the AUXBUS right on U1 pin 40. I tried other remedies. Thinking there might have been something weird about the control cable connecting the K2 and KAT100, I swapped it out for another straight through cable. No change. Maybe U1 was not properly seated in it's socket. I removed it and reseated it. No change. This problem appeared to the temperature and humidity related. This is why it happened sometimes in Walton county, never in Gwinnett county, and nearly always in Fulton county. Since power was present, what was delaying the lighting of the LEDs? Looking at the circuit diagram, the LEDs have to be turned on programmatically by U1, the PIC micro controller. Maybe it wasn't resetting properly? But, power-on reset logic is part of the chip itself. Something else had to be delaying the reset. I decided the problem might have to do with the U1 clock. If the clock oscillator didn't start up right away, that would delay the reset. Putting scope probe on pins 13 and 14 or U1 deepened the mystery. When the KAT100 would fail to power up, these pins would float up to about 1 volt. When it worked, the pins would be locked at 0 volts. Why 0 volts? Because the chip goes to sleep after initialization! This uses much less power. U1 awakens on transitions on the AUXBUS. So, it seemed very likely this was the problem. But the clock circuit is dead simple. U1 connects to Z1, a ceramic resonator. I tried hitting Z1 with a heat gun, but I didn't see any immediate effect. Then I nudged Z1 with a screwdriver, and the KAT100 came up immediately. Maybe I had a bad device, or maybe a bad connection. I reflowed the solder on U1 pins 12-14, plus the three pins on Z1. This worked right away, and even the next day when I let everything cool down. Solved! It appears it was a problem with the U1 clock circuit, likely because of a poor connection to Z1. If it fails on me again, I'll likely end up replacing Z1 entirely. Sometimes, it helps to just admit it to yourself. Let me explain. Back in December 1st 2017, I started using FT8. I set up the WSJT-X Mac software and made my first contact. Mostly operating on 17m, 30m, 12m. I later discovered 6m. Indeed, this last summer was a huge opportunity to work much of the country on sporadic-E (Es) on 6m. I was amazed to work 40 states in just one summer. On all bands, I've worked all fifty states, and quite a few countries with this mode. So, I've been using FT8 for months. However, one thing bothered me - everything seemed off frequency. You see, there are standard frequencies that are published for FT8, 12m is 24.915 MHz. But if I dialed in 24.915 MHz, everyone was too high -- like no one was using frequencies less than 2 kHz, and some were visible at 3.5 kHz and higher. My solution to the problem was simple -- I just tuned higher. I decided that 24.916 was more accurate, and operated that way for months. I even reprogrammed WSJT-X so the 1 kHz higher frequencies were the right ones. But, it bothered me. It seemed wrong. I managed to work Baker Island using FT8, but it was a bit of trouble, and I had one fellow email me saying I was calling too low for the fox/hound DXpedition mode. I used a higher frequency and almost immediately had an exchange. This made me think about this issue more. Originally, I had my K3 set up for RTTY using AFSK. This means I was using the AFSK A data mode on each band. For FT8, I would select DATA REV, so it would use USB instead of LSB. What I didn't realize is that AFSK A means the display frequency is adjusted to reflect the Mark frequency of (in my case) 1445 Hz. This accounts for my frequency being too low -- I was off by 1.4 kHz. With that figured out, I switched to DATA A, which has the display frequency of the suppressed carrier, as it would for LSB or USB. The frequency jumped, and I tuned again to the standard frequencies (the real ones, not my artificial higher ones). But, it didn't work. I couldn't hear any signals. Back to AFSK A, and they are there, but switch to DATA A, and they are gone. What? Turns out, AFSK uses LSB by default, while DATA A uses USB. Since I was using DATA REV, this means DATA A was LSB. Oops. Back to straight DATA mode, using the DATA A sub-mode, and everything works just as it should. Gosh, that's too easy. I'll just have to remember to change the DATA MD back to AFSK when I'm doing RTTY. Apparently, the budget proposals for NIST don't include funding for WWV and WWVH. If these budgets go through, then our beloved stations on 2.5, 5, 10, 15, 20 and 25 MHz will go silent after over 98 years of broadcasting. I can't imagine radio without these stations. There have been countless times I've set my clocks and watch by them. And while the internet and NTP may have largely replaced them for that function, there's no equivalent internet protocol for frequency measurements. I remember how cool it was late one evening when I could hear both WWV and WWVH on 2.5 and 5 MHz. I can't imaging calibrating a home-brew radio without the reference signal of WWV or WWVH. I guess there's always CHU, but the frequencies aren't as handy. I encourage you to write your Congress persons and let them know how important funding of WWV and WWVH are to you. There's also a White House petition to sign, it needs about 87,000 signatures at the time of this writing. I would hate to lose WWV and WWVH. Please do your part. A year ago I found a deal on a used Cushcraft A50-3S. I managed to scoop up this barely-used antenna for $80. It was missing the mast U-bolts, which set me back about $10 from Cushcraft. 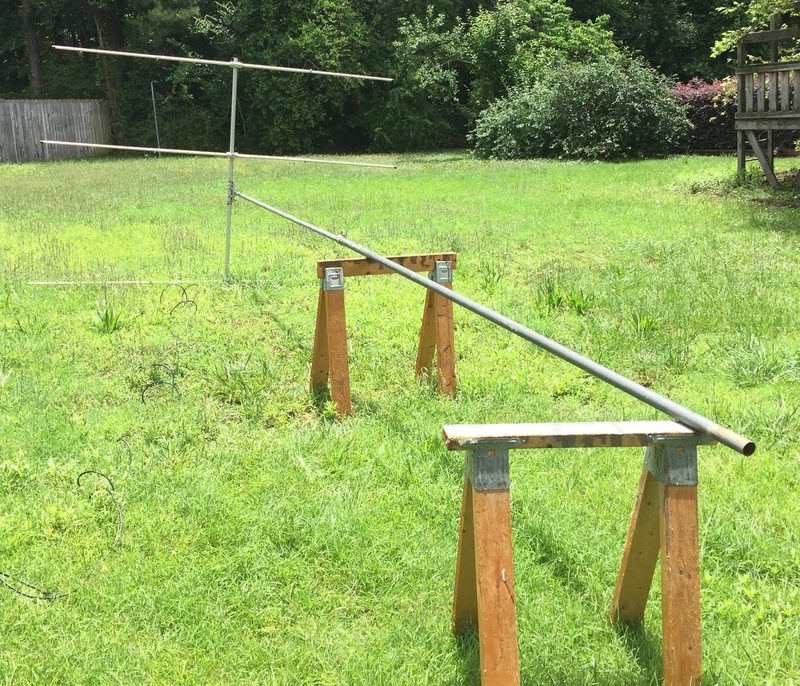 For less than $100, I had a functional 6m beam, which languished in my basement for way too many months. I fixed that problem the past weekend. 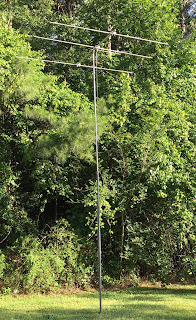 I got the 6m beam outside, put it on a mast and checked the SWR. My dimensions came out perfect, as the SWR curves were exactly where they were supposed to be. The mast was something I had lying around. It originally supported a Butternut HF-4B beam and a long 17-element F9FT 2m beam. That was a long time ago - about 25 years. The mast consists of two 10 foot sections of EMT. I would normally not recommend using EMT as a mast material. It's not a structural support, and the metal alloy is fairly ductile, as it is meant for bending. For really light-duty service, it can be adequate. I don't remember the exact sizes of the tubes. I think the bottom tube is 1 1/2" EMT, and the top is 1 1/4" EMT. The top tube slides easily into the larger bottom tube. A 1/4" bolt about 12" from the top of the larger tube supports the smaller tube, giving an overall length just shy of 19 feet. An EMT coupler with some long bolts keeps the smaller tube firmly against the wall of the larger tube. 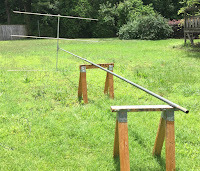 With the mast across the sawhorses, and the reflector just off the ground, the antenna is easily checked for tuning. With that done, I just needed a way to hold the mast vertical. I already had an eight foot mast in the yard that used to hold the Cushcraft R7000. With a couple of short pieces of rope, the 19 foot mast was lashed to the eight foot mast. And, voila! The lashings hold the mast firmly, but it can be rotated by hand. (aka Armstrong rotation) It may only be temporary for now, but it works quite well. I put many 6m stations in my log this weekend on FT8. It's good to have a real 6m antenna! What's the use of having an excellent soldering station like the Hakko FK-888D if you don't have something to build? 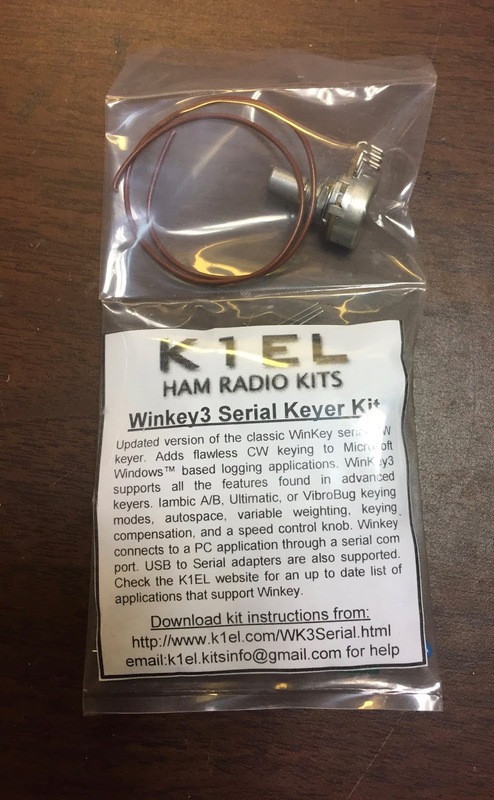 I recently splurged about $40 and bought a WinKeyer 3 Serial. 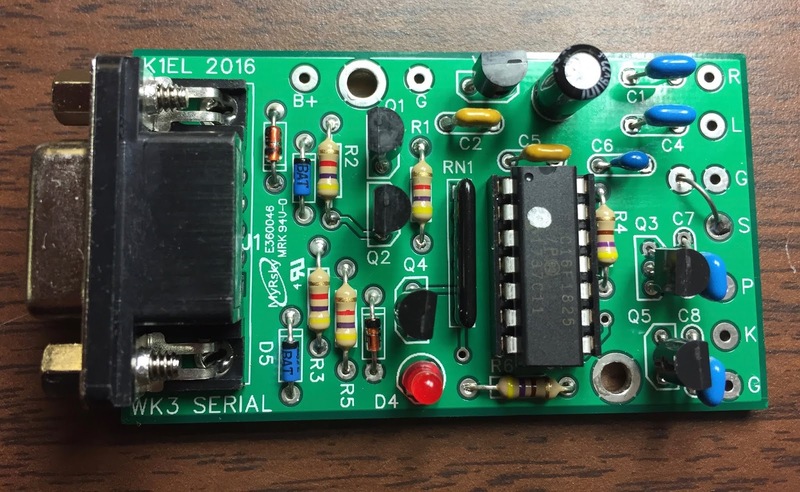 This is a very nice little board that has a WinKeyer 3 chip powered solely by the RS-232 signals on the serial port. I figured this would end all the timing problems I have with keying the rig from a serial port RTS line. I would have preferred to buy the similar WinKeyer USB Lite, but unfortunately, that product has been discontinued. I suspect it may be because the Lite cut into the sales of the more expensive WKUSB-SMT. The kit arrived in a little plastic pouch. There's no manual, but there's a little slip of paper with a URL to download a manual. Not a problem. I just parked one of my computers on the workbench to read the instructions. Assembly went quickly. I actually ended up following the steps out of order. I guess I should pay better attention, as the first part I assembled was the IC socket. I skipped assembling the resistors and diodes. Oops. I quickly realized my error and went back and assembled all those parts. This is not a Heathkit. It's more like "insert all the resistors, solder, insert all the diodes, solder, insert all the capacitors, solder" type of kit. many parts in this one. For me, this was a piece of cake. Given how simple this kit is, it wouldn't be hard for a much less experienced kit builder. I elected not use use the speed potentiometer at the moment. Once assembled, testing is a matter of hooking it up to a Windows machine and using a test application. K1EL provides two programs: WKtest and WK3demo. The WK3 Serial Kit manual has a link to WKtest, although this appears to be an older application. WK3demo is the preferred application to use, at least according to the web site. I tried both, and they both worked. This kit fired up and worked right after assembly, so no troubleshooting was necessary. I could easily program CW text to flash the on-board LED. Perhaps the hardest issue I had was figuring out exactly which USB Serial device I had hooked it up to. Now that it's assembled and tested, I'll need to find a suitable box to mount it in, and wire up connectors to hook it to the rig. I didn't manage to complete this before the WPX CW contest, so perhaps next time. When I first started taking Martial Arts over ten years ago, I weighed 252 pounds. I recently weighed 226 pounds. Perhaps not a huge difference -- especially since most of that weight was lost in the first six months. That's not to say I haven't experienced any changes from my training the last several years. Far from it. I continue to trade fat for muscle, even if my weight is virtually unchanged. When I look at myself in the mirror in the morning, I don't see the fat guy I used to be. Indeed. From about four inches above my waist up, or eight inches below my waist down, I actually look kind of skinny. It's that one foot in the middle that's trouble. That's the fat guy still hanging on. Eliminating him is going to take a lot more work. Hakko FX-888D standing ready on the corner of the workbench. 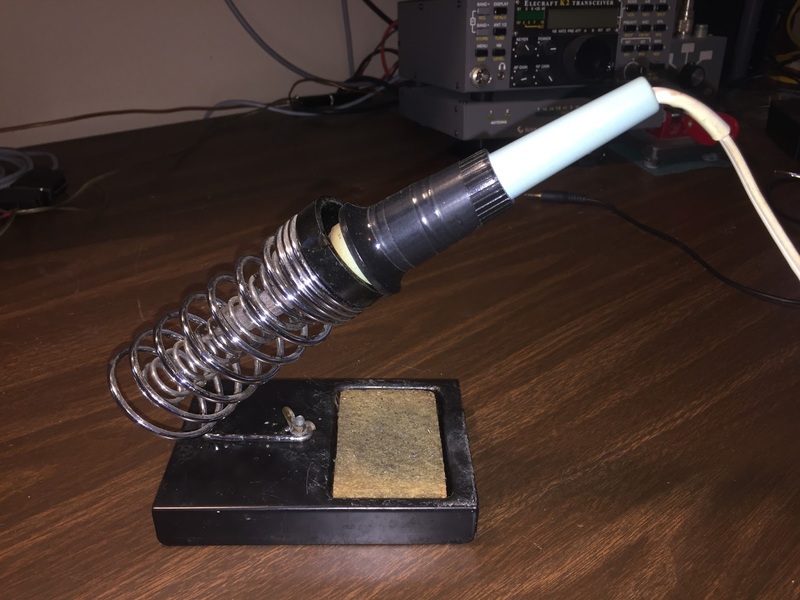 If you're going to build something, you need a soldering iron. My original soldering iron was a crappy Radio Shack unit that got way too hot and burned tips up on a regular basis. I hated it. At some point, I upgraded to a Weller WP-25 soldering iron. I'm not certain when I bought it. It's been at least 30 years, perhaps 40 years. I can't remember if I used it to build my SWTPc 6800 computer system in 1977 (and that's another story). But it did a fine job putting together the venerable Elecraft K2/100. The ancient WP-25, still going strong. While the Weller WP-25 has gotten long in the tooth, it keeps on going. A couple of decades ago, I dropped it and cracked the black plastic hand guard. It has since been held together with electrical tape. I have purchased two soldering iron holders for it, and worn one out completely. Despite the age and abuse, the iron still works quite well. Plus, I have enough replacement tips for a lifetime. I think I'm on my second or third -- they last forever. So, how did I end up with the Hakko FK-888D? Dumb luck. Every year, I share a Christmas list with my extended family. This year, I decided I'd like a soldering station, but not something too expensive. I found that the Hakko FK-888D could easily be had for less than $100. So, I put it on my list. Lo and behold, my Dad purchased one for Christmas. While I can't say I'm thrilled with the bright blue and yellow colors, the unit does sit well on the desk. The soldering pencil is slim, but it goes easily into the holder. The holder has both a scraping wire and a sponge -- great tools for maintaining a clean tip. The station unit sits rather tall, but is so heavy there's no danger of it falling over. It's virtually all metal transformer inside. The user interface is a bit awkward: Three 7-segment LEDs and two buttons are it. You'll have to run back to the manual to figure out how to configure anything. First turning it on, I was surprised at how fast it warmed up. The old Weller took at least 3-5 minutes before it was ready. 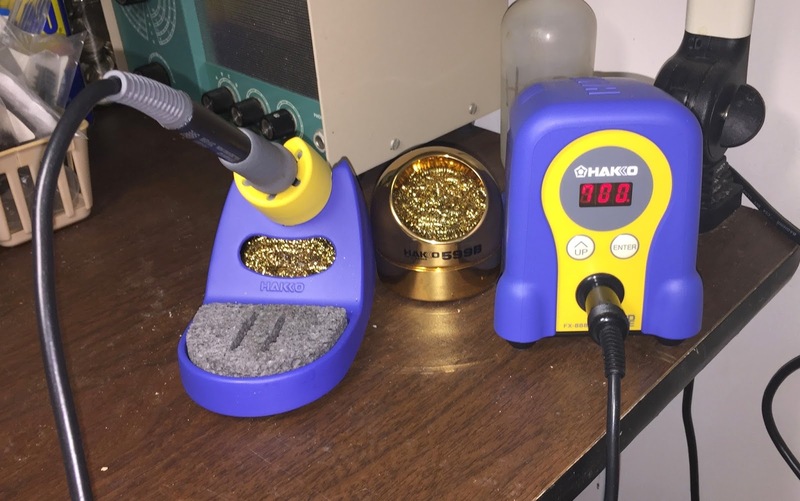 The Hakko was ready to solder in less than a minute! The default temperature is 750 degrees F. I backed this off a bit to 700 degrees F. That's plenty hot enough to melt solder. I've only used this iron a little bit, but I'm amazed at how well it works. It heats up the work quickly, melting the solder soon after application, even on junctions with large terminals or lots of wires. I used it to desolder an old piece of equipment, and the job went very quickly. I'm looking forward to building something with the Hakko. I think I'm going to like it. 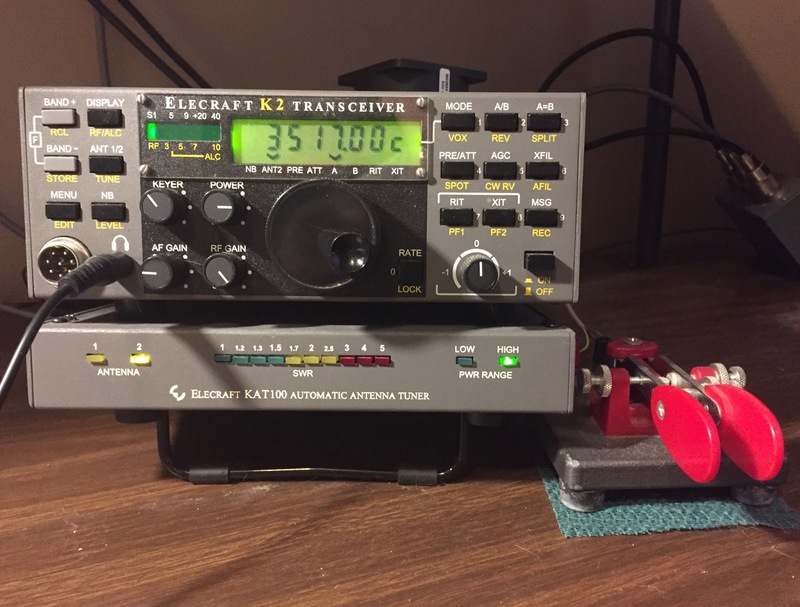 Elecraft K2/100 with KAT100 tuner, as it sits on the desk. 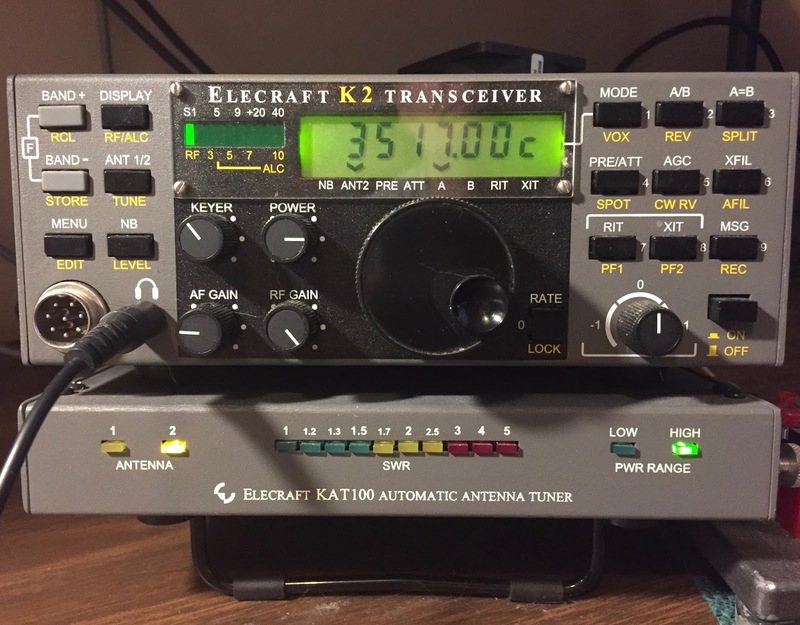 I cannot believe it has been fifteen years since I built the Elecraft K2/100! When I first got interested in amateur radio, in the mid-70s, I wanted to build my own rig. While I studied for my novice, an elmer of mine insisted that each ham should build his own transmitter. He gave me some parts, and I made an honest attempt, but the "Novice" Transmitter didn't actually work until many years later. Later, while preparing for college, I tried building a QRP transceiver I might use in the dorm. I built a 7 MHz FET VFO, a direct-conversion receiver, a 3 watt transmitter, and a even a KOX or Key-Operated Switch to do semi-break-in with side-tone and an relative power and S-meter. This design never did work. Never heard a peep out of the receiver. While the transmitter produced a couple of watts output, it couldn't decide if those watts were on 7 MHz or 14 MHz. The key mistake I made in my youth was building the entire project before testing anything. The VFO worked, the KOX worked, but that was about it. I had tried to build my own designs, without a lot of success. 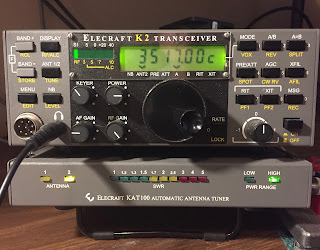 I noted the Elecraft K2 introduction in 1999 with interest, but I wasn't excited. While relatively inexpensive, it only produced 10 watts output. I needed a replacement for the venerable Kenwood TS-430S, and that meant 100 watts output. When Elecraft announced a 100 watt PA for the K2 later in the year, I was hooked. Best of all, I could buy the rig in installments, adding options over time. I joined the Elecraft mailing list, and read everything I could about this great little rig. Sold! 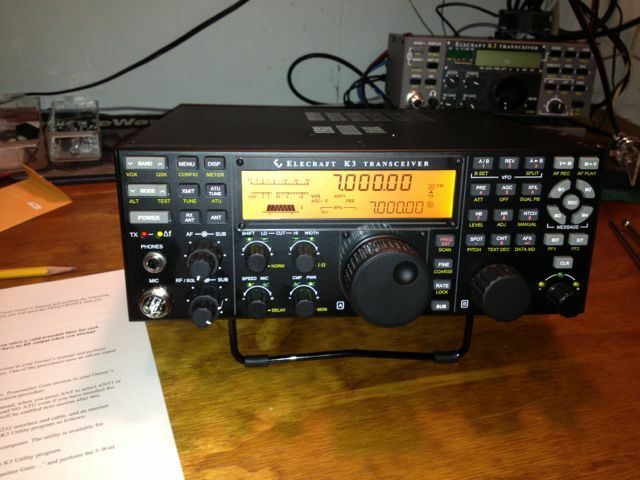 On March 1, 2002, I placed an order for a plain Elecraft K2/10 and would receive Serial Number 2548. On arrival, I spent and hour or two each night building. This wasn't something you could knock together in a couple of evenings. I wanted to do a good job as well, to savor the process, instead of just slap it together. In total, the basic K2 took me nearly 30 hours to build. Wayne Burdick (one of the Elecraft founders) at some point asked me for any building notes or comments on the K2. This gives you an idea of how grassroots a company like Elecraft is. I sent him a series of four notes with my impressions and some detailed comments. I don't know if he actually used this material to improve the K2 assembly manual, but it's a nice thought. The K2 is no Heathkit. A real Heathkit would have more drawings and diagrams at each stage of assembly. But, hey, Heathkit is out of business and Elecraft is not. Any K2 builder can spin yarns about the joys of winding toroids. There are dozens of them in the K2. Frankly, I didn't have that much trouble winding toroids. Tinning the toroid leads, on the other hand, was a real pain. Especially when I didn't tin them up quite far enough and had to do it over. After 20 hours of construction, I did the Alignment and Test II section and was listening to 40m signals coming through the receiver. Given my previous experience, this was very exciting. You have such a feeling of accomplishment when something you built actually operates. For the most part, the K2 worked flawlessly after construction. I did have a problem with flaky AGC action, which was fixed with a resistor substitution and a replaced transistor. I also had an intermittent INFO 080 (the dreaded AUXBUS failure) which was caused by a bit of waxy burnt flux between two pins on the control board. The Elecraft mailing list and support email address gave me the information I needed to diagnose these problems. With the basic K2 built, I started ordering and building options. The KSB2, the SSB module, was up first. The KSB2 has the densest board of all the K2 kits, making it the hardest to assemble. And the FT23-43 cores were so tiny, I originally thought they were fiber washers. After the KSB2 came the KAF2. I had read enough to know that the K2 audio had an unpleasant hiss that was knocked out by the KAF2 audio filter. Beyond that, however I never found the audio filter to be that useful. While the KAF2 also has a real-time clock, I never found much use for it. Next was the KNB2, the noise blanker. Having used the one on my Kenwood TS-430S, I felt that a noise blanker would be a required option. But the KNB2 isn't terribly effective at eliminating the noise sources I most often encountered. I was able to determine it was working, and later managed to make modifications to improve it's effectiveness. The last option for the basic K2 I built was the K160RX -- which has to be the simplest option board I've built. Once installed, I had a very functional K2, with 160-10m coverage, CW, SSB, Noise Blanker, Audio filter. All I needed was to wait for the KPA100 option. And, indeed, as soon as it was available to order, I placed my order the same day. And then I waited. Fate intervened, however. While I was waiting for the KPA100 to ship, I was laid off from my job. This was the summer of 2002. The internet bubble had burst, and there were several shocks to the economy, what with the 9/11 tragedy, and the Enron and Adelphia Cable financial scandals. Without employment, spending hundreds on the KPA100 didn't seem wise and I cancelled my order. I feared I might need to sell my K2. It took me nearly four months to find a new job, as the market was really tight. But as soon as I had a new position in hand, I re-placed my KPA100 order. I had some trepidations about the KPA100, but it went together pretty easily, and it worked like a charm right from the start. At this point, the K2/100 became my main rig. With computer control -- something that I had coveted for years -- contest band changes became much easier. I loved it. Close up of the friendly face of the K2. Once built, for a few years I was regularly tearing into it to make modifications. The improved 2nd XFIL mod, the KI6WX improved CW filter rejection mods, alternative AF gain control. The massive A-to-B upgrade. The BFO temperature stability mod. Redoing all of the crystals with the K2KSB2XTALS mod. The KSB2 firmware update to v1.08. The PLL temperature compensation mod. The KPA100 Rev B upgrade with upgraded shield. K2 firmware update to v2.04. K2 Keying modification. The QSK improvement modification. KPA100 current consumption mod. The power control mod. During these first few years, I also added the KAT100, the KDSP2 and my favorite, the Finger Dimple. The KAT100 really made the rig more versatile. The KDSP2 helped out on SSB with some needed bandwidth filtering, and the auto-notch filter. But the Finger Dimple made tuning the rig a much more comfortable proposition. From Mid-2005 until 2010, K2/100 served as my main rig without any modifications. 2010 brought a flurry of final mods. The VCO Shielding mod. The KPA100 Rev D upgrade. The KNB2 response and threshold sensitivity mods. Once I finished all this, I bought the Rework Eliminators kit -- that enables one to swap out option modules without making changes. I don't believe I've used them. Although the K3/100 replaced the K2/100 as my main rig, I still use the K2 regularly. It is pleasant to listen to and quite capable. The K2 has earned an honorable place on my operating desk, and deserves to be called a venerable rig.